My wife and I had the most fantastic 2 week holiday at the Simeulue Surf Camp, very relaxing!!! The friendly staff always had a smile and were keen to please. The view across the bay to the rainforest covered hills was beautiful, awesome sunsets!!! The bungalows were clean, comfortable and well appointed - hot showers, a DVD player and comfy bed with a good mosquito net. Delicious authentic Indonesian food was prepared by the lovely Ani, Try the pineapple and papaya juice. Great little private beach (3 min walk) was a gem. Two great day trips, waterfall rainforest walk and a boat trip to Minchau Island are well worth doing. Just left Simeulue and we're missing the island life already! 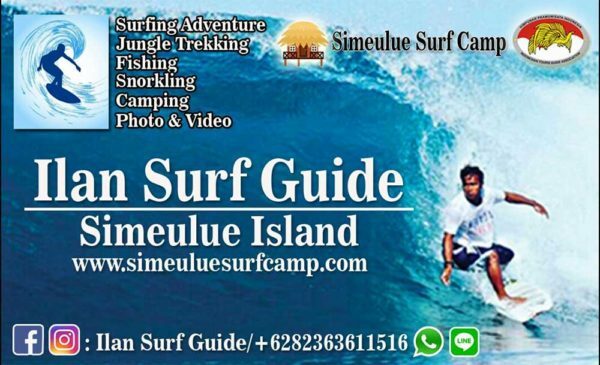 Simeulue surf camp might not be listed on TripAdvisor but we are so glad we decided to give it a try! It is THE place to stay if you want to be near the action but not directly in it! Ilan our surf guide and the staff were so friendly and welcoming, the camp was very clean and quiet and it's just a quick five min drive from a great surf spot! We had the whole place to ourselves and it was just fantastic. Definitely recommend this place if you want to unwind and relax (unless you prefer to stay at the other camps where they hold daily karaoke sessions and "parties" for the police)! Awesome place to stay, great waves, beautiful people and island. The bungalows were cool and comfortable over looking the bay. Went paddleboarding straight out the front and had an awesome jungle trek. I recommend to anyone travelling through Indonesia, surfer or non-surfer as a great adventure holiday. Will definitely be back! Thanks Geoff, Nanik and staff. If you're looking for somewhere friendly, relaxing and close to plenty of wave options you couldn't do better than staying with these guys. Staff are really helpful, the food's delicious and didn't stop coming. Recommend getting in touch with ilan to show you around the island for a day or two when you get there as there's a lot of coastline to cover and the surf spots all work in different conditions. Cheers to Geoff, Ani, Ilan & Mr Man for a great holiday! We had a fantastic stay at SSC food and accomodation was first class not to mention the wonderfull surf we had in at lest two daily helpings Top Class, having the scooters to run around allover the island was a blessing. I would consider this camp to be the best organised and equipped camp on the island with great staff. This is not a party camp its great for just chilling out and getting great waves . Enjoy DanT PS you can get a 9' long board up on the plane.